PSST, Harley." Cherise's voice, although quiet for her, was loud enough to get us into trouble with Miss Smith. "Harley!" 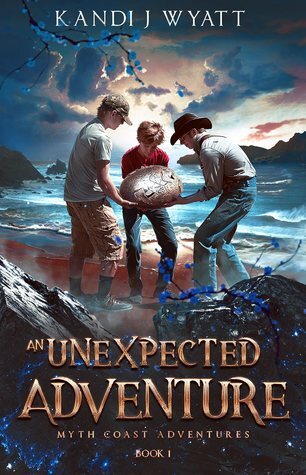 Four eighth grade friends find a dragon's egg on the beach while looking for thundereggs that Professor Raleigh is looking for. This complicates an already complicated summer full of jobs, family issues, and a NSA agent. In the beginning, we're treated to a slice of life for the junior high students, and life in the bed and breakfast that Harvey's family runs. Then they find the egg, and band together with their science teacher to keep the egg safe, then the dragon once she hatches. The story covers April through the end of summer vacation, and the children all grow and become better friends. They are determined to take care of the dragon as best as they can and really enjoyed spending time with her. There's certainly kid-friendly intrigue with keeping the dragon safe and fed as the year goes on. Though the main characters are eighth graders, children in younger grades would enjoy this story as well. Harley has asthma, which might be a draw for some kids because it doesn't frequently come up in children's fiction, let alone in a hero of the story. These are well mannered and good kids, and they don't disrespect their parents or elders. Even the Professor, as he descends into a creepy caricature of a bad guy, isn't treated badly. He doesn't act in the manner of a government agent, so that throws me out of the story a little bit. Younger readers might not mind how he behaves as much. Linked to First Chapter, First Paragraph at I'd Rather be at the Beach. Sounds like a fun story for middle graders. This week I am featuring A Knife in the Fog by Bradley Harper - a historical mystery from my review stack. Happy reading! I definitely enjoyed getting to know the kids and the story was a fun read. Now I want to know more! Thanks for sharing, and for visiting my blog. That opening paragraph was a real teaser. It makes me want to read on. A good hook is really important. A lot of kids don't have the patience to wait a chapter or two! So glad it worked. It's fun to hear your feedback. I know a few middle-graders I'll recommend this book to. Great! It's a fun book to read and the kids are really relatable. That sounds like huge fun! I'd give this book a try! Thanks so much for sharing. Glad you enjoyed. Sounds good and that cover looks exciting. Such a brilliant cover! I really like the look of this for myself lol :) Glad you enjoyed it. Amalia Chitulescu did the cover. I really was pleased with it. Thanks for stopping by yesterday! This sounds like a really fun book! Thank you for sharing it.